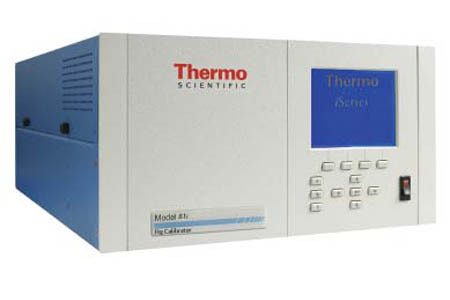 The Thermo Scientific Model 81i calibrator utilizes a vapor generator that allows standard calibration and dynamic spiking into the extraction probe. A wide calibration range lets the user directly calibrate the analyzer at post-dilution concentrations. The calibrator is ideally suited for daily zero/span checks and routine converter efficiency and linearity testing. Designed to meet the provisions of U.S. EPA 40CFR Parts 60 and 75, the Mercury Freedom System provides a complete mercury monitoring solution that reports elemental, ionic, and total mercury in exhaust stacks from both coal-fired boilers and waste incinerators. The Model 81i calibrator also offers benefits of the iSeries platform which includes flexible communications, increased serviceability, and an easier to use interface. Ethernet connectivity provides efficient remote access, allowing user downloadable measurement information from the instrument without having to be on site. Captive hardware and slide-apart modules allows easy access for service and periodic maintenance. Short-cut keys can be easily programmed to allow you to jump directly to frequently accessed functions, menus or screens. The larger interface screen can display up to five lines of measurement information while the primary reporting screen remains visible.